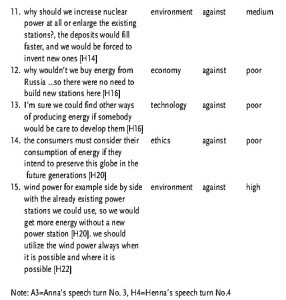 In this study [i] 24 secondary school students engaged in argumentative debates (role play) about nuclear power in pairs in face-to-face or synchronous network chat environments. 14 students defended their personal opinion, six students had to take the role of an antagonist against their personal stand, and four students were asked to defend a stand that was given to them as their original opinion was neutral. The data analysis will focus on the nature and quality of argumentation. Comparisons will be made between face-to-face and network debates, and between students who defended different standpoints. Argumentation skills help students to participate as democratic citizens in general debates on many societal questions, such as environmental issues, gender equality, and racism. In these debates students should be able to take a stand and to identify the arguments used by journalists, politicians, scientists, teachers, and their classmates and friends. In the future they will be entitled to vote so they should be able to evaluate the validity and sufficiency of presented arguments during the different phases of decision-making. One possibility to practise these skills is to take part in argumentative dialogues either face-to-face or through the network. When students practise argumentation skills in technological environments it is not guaranteed that the interaction is effective from the point of view of learning. The problem is how to get students to collaborate and carry on argumentative dialogues. In this study, argumentative debates in face-to-face and network (chat) environments are compared. 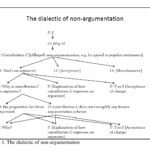 The use of dyadic argumentation, i.e. argumentative debates in pairs, has been shown to increase cognitive engagement in thinking about the topic and to enhance the quality of reasoning about the topic (Kuhn, Shaw & Felton, 1997). However, according to Golder and Pouit (1999), in order to engage in argumentative dialogue, the discussion topic must be debatable. A debatable topic leaves space for negotiation because it does not offer objective truths. In this study students were asked to debate environmental issues, as they offer points of view to think about. We (Marttunen & Laurinen, 2001a) have demonstrated earlier that role play is an effective means to promote argumentation skills in Finnish higher education. According to the students who took part in the study, it was easier to engage in face-to-face and e-mail discussions when the standpoint was fixed in advance and the other students knew that the position assigned to a student did not necessarily represent her/his own personal opinion on the issue in question. As the students had the possibility to hide behind a role, they presented stronger arguments and put forward their arguments more clearly than would otherwise be the case. In the present study we compare students who defended their own standpoint with students who were asked to support a standpoint that opposed their own opinion or who were unable to take a stand. We were interested to see how the use of role play activated students in producing argumentative dialogue and affected the quality of the debate. 3. did the type of the dyad (either only one member or both members of the dyad defended their own opinion) affect the quality of debate? The subjects were 24 Finnish students (15 females and 9 males) who took part in a cross-curricular teaching experiment (a combination of Finnish language and Ethics courses) in the secondary school of Muurame during the autumn term 2001 (see SCALE project 2002, Deliverable 1 & 2). The students were divided into two groups with similar skills in argumentation on the basis of the test which the students took at the beginning of the teaching experiment. The other selection criterion was an equal gender distribution between the groups. One group discussed face-to-face (n=12; 6 pairs) and the other group by chat (n=12; 6 pairs). The aim of the teaching experiment was to teach argumentation skills by using different tasks, like reading and analysing argumentative texts, attending to argumentative discussions, and writing argumentative texts. The length of the teaching experiment was 12 weeks (two six-week periods). This study focuses only on one part of the teaching experiment – four 45 minute -lessons of practicing argumentation during the second six-week period. The lessons proceeded in five phases as follows: Firstly, the students read and analysed five newspaper and Internet articles concerning nuclear power in five groups. Each group presented their article and the results of their analysis (arguments pro and against nuclear power) to the other groups. Secondly, the students wrote an individual opinion writing on the topic. Thirdly, the students discussed the topic in pairs both face-to-face and by using synchronous chat tool (DREW(ii)). Fourthly, the students filled statements in a structured graph and connected the statements with supporting grounds by the aid of the graph. The students worked collaboratively in pairs reflecting on their debate. Fifthly, the students were asked to revise their own opinion writings in light of what they had experienced during the debate and collaborative reflection. In both groups the students were divided into pairs on the basis of their individual opinion writings on nuclear power so that as many students as possible could defend their own opinion during a role play. Furthermore, the students had to represent opposite standpoints (protagonist – antagonist). If their opinion was shared or there was a disproportion in their standpoints, the standpoint (for or against) which they were asked to defend was given to one member of the dyad. Thus, 17 % of the students (10 in face-to-face and 7 in chat environment) defended their own opinion, and 29 % (2 students in face-to-face and 5 in chat) defended a standpoint given to them. Two types of dyads were constituted: A-type (n=5) in which both students defended their own standpoint, and B-type (n=7) in which only one student defended his/her own standpoint whereas the partner defended a stand given to him/her. The data consisted of 6 face-to-face debates and 6 chat debates. The time allocated for the students to debate was about 20 minutes for face-to-face and about 40 minutes for chat discussions. The face-to-face debates were tape-recorded and transcribed. The chat debates were saved automatically to a file. The following instruction was given: “Defend your standpoint in the debate. 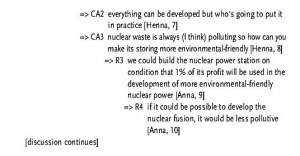 The issue to be discussed during the debate is: Does Finland need a new nuclear power station? Try to find answers to the question whether it is wise to build a new nuclear power station in Finland or not?”. In order to clarify the argumentative structure of the debates, two approaches were combined. The pragmadialectical method (van Eemeren et al. 1993) was applied when the argumentative content of each debate was presented by compressing the content of the debate into short sentences. 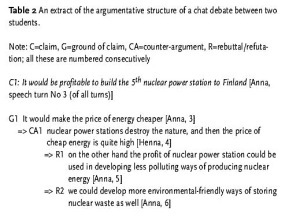 The argumentative structure of each debate was analysed by differentiating claims, grounds, counterarguments, and rebuttals from the debate according to the model by Björk and Räisänen (1996; see Figure 1). This model was developed for teaching argumentative writing to university students. 3. level of elaboration. The level was poor if the argument was just mentioned, medium if the argument included at least one explanation, a clarification, or an example, and high if the argument was somewhat more developed than an elaboration at the medium level or if the argument in question was elaborated further later on during the dialogue. The idea of the levels of elaboration was modified from the QED (the quality of the space of debate) method(iii). In order to indicate the quality of argumentation, seven variables were formed (see Table 1). Five of the variables described the quality of the arguments presented by the individual students: the index of individual counter-argumentativeness (indCA), the number of topics, the number of words used, the number of arguments (ind), and the level of elaboration of the arguments. Two variables described the quality of the debate between two students: the number of arguments (dyad) and the level of elaboration of the arguments. Examples of the analyses are illustrated in Tables 2 and 3. 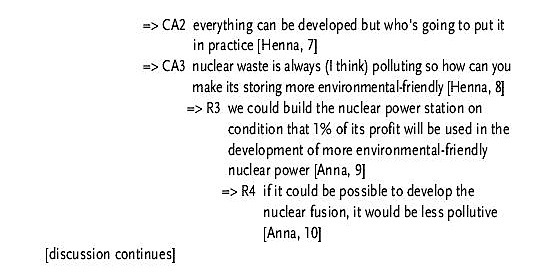 All examples are based on the chat debate between the same two students (Anna and Henna(iv)). 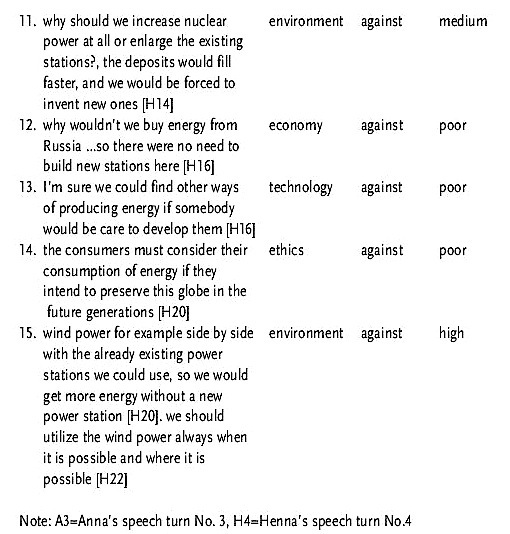 The extract of the argumentative structure of this chat debate is illustrated in Table 2. Table 3 consists of the arguments presented by Anna and Henna during their mutual debate. 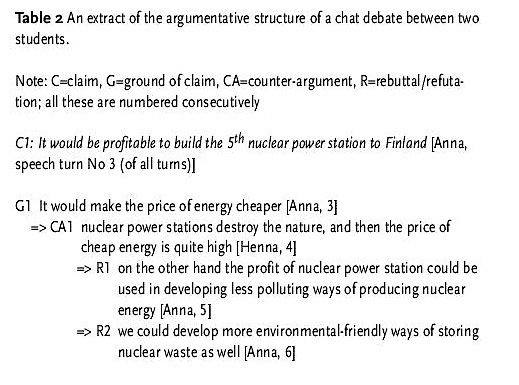 The thesis of the debate was: it would be profitable to build the 5th nuclear power station to Finland. The students produced on the average 5.8 arguments during the debate (Table 4). These arguments apply to 3.1 topics on the average. The level of elaboration of these arguments was on the average 1.66. The mean of the students’ index of counter-argumentativeness was on 0.88 (if the students had reacted to every presented claim, ground, counterargument, and rebuttal they would have reached the value 1.00). These results indicate that the quality of argumentation in students’ debates was quite good in terms of counter-argumentativeness but, in contrast, quite weak in terms of elaboration. The results of the face-to-face students were consistent with the chat students. Furthermore, the results in Table 4 indicate that the students who defended their own stand in the debate got higher values in all five variables than the students who defended a stand given to them. However, there were differences between the modes of study. In the chat environment the students upholding their own stand produced clearly more arguments (6.0 vs. 4.0) and their arguments were more elaborated (1.75 vs. 1.55) than arguments by the students who did not defend their own stand. But, in the face-to-face environment the students produced approximately as much arguments with the same level of elaboration despite of the type of stand (note that there were only two students in face-to-face debate who did not defend their own stand). The dyads of the B-type (own stand vs. not own stand) produced more arguments than the dyads of A-type in both environments (Table 5). However, the level of elaboration of arguments was higher among the dyads of A-type (own stand vs. own stand) than among the dyads of B-type in both environments. The secondary school students had difficulties in engaging in the argumentative dialogue in role play if they had to defend a stand which was opposite to their personal opinion on the issue. The difficulties emerged especially in the chat environment. This is consistent with the results by Stein and Bernas (1999). On the basis of three different studies they conclude that arguers, independent of age, have approximately twice as many reasons for supporting their own position as they have for supporting the opposing position. This problem was not overcome by giving the students in advance reading material concerning rather well grounded standpoints from both sides of the issue. Perhaps the topic (Nuclear Power), even though it was debatable, was too difficult for the secondary school students. One explanation for the small number of arguments and the lower level of elaboration of the students not defending their own stand in chat environment as compared to the students who defended their own stand, is that secondary school students’ argumentation skills are not sufficient for this kind of position taking. This explanation is in accordance with our earlier observation that university students had no difficulties in position taking in role play provided that they had been given plenty of reading material on the issue before they started to debate (Marttunen & Laurinen, 2001a). The results of this study can not be generalized due to the small number of subjects. Actually, the same students have debated on another topic, Genetically Modified Organisms (GMO), by following similar task assignment and learning procedure as presented in this paper. This time, however, the students who had debated face-to-face on nuclear power debated on GMOs in chat environment, and vice versa. The comparison of the same students in these two learning conditions will be made in the future. It has been shown that university students learned different argumentation skills when they practised their argumentation skills in face-to-face environment than when they discussed via e-mail (Marttunen & Laurinen, 2001b). In e-mail discussions the students focused more on grounding their arguments, and in the face-to-face discussions the students paid more attention to counter-argumentation. This means that it would be effective to use both traditional teaching methods, like face-to-face debates, as well as new educational network environments when practising argumentation skills. The authors would like to thank Satu Perälä-Littunen for her comments on the language of this article. [iii] QED method – the quality of the space of debate developed by M. Quignard (GRIC, Lyon), in collaboration with M. Baker (GRIC, Lyon), J. Andriessen and M. van Amelsvoort (Utrecht University). Details can be found in Deliverable 8 of the SCALE project, at: http://www.euroscale.net/. [iv] Students’ names have been changed. van Eemeren, F. H., Grootendorst, R., Jackson, S. & Jacobs, S. (1993). Reconstructing argumentative discourse. London: The University of Alabama Press. Golder, C. & Pouit, D. (1999). For a debate to take place the topic must be debatable. In J. Andriessen & P. Coirier (Eds. ), Foundations of argumentative text processing (pp. 137-148). Amsterdam: Amsterdam University Press. Kuhn, D., Shaw, V. & Felton, M. (1997). Effects of dyadic interaction on argumentative reasoning. Cognition and Instruction, 15, 287-315. Marttunen, M. & Laurinen, L. (2001a). Promoting argumentation skills in university: comparing e-mail and face-to-face studies. In H. Isomäki, J. Kari, M. Marttunen, A. Pirhonen & J. Suomala (Eds. ), Human-centered technology and learning (pp. 17- 53). University of Jyväskylä. Department of Teacher Education. Jyväskylä: Jyväskylä University Printing House. Marttunen, M. & Laurinen, L. (2001b). Learning of argumentation skills in networked and face-to-face environments. Instructional Science, 29, 127-153. Stein, N. L. & Bernas, R. (1999). The early emergence of argumentative knowledge and skill. In J. Andriessen & P. Coirier (Eds. ), Foundations of argumentative text processing (pp. 97-116). Amsterdam: Amsterdam University Press. What is 18 + 2 ? ISSA Proceedings 1998 – Ad Baculum Is Not A Fallacy!